Home Catrice Eyeshadow Review | Catrice Velvet Matt Eyeshadow + Swatches (6 Colours)! Review | Catrice Velvet Matt Eyeshadow + Swatches (6 Colours)! I was meaning to write this post when Catrice made their way to Malaysia's market early of this year but I had been trying out other stuffs until I forgot about it. Last February, I purchased myself a Catrice Velvet Matt Eyeshadow in the colour 040 Al Burgundy as I thought it was such a lovely colour that I would use quite often. For those of you who is looking for Catrice Cosmetics, you can find their stand at selected Guardian Pharmacies. The brand is apparently a sister company to Essence, which now makes sense why both of them have somewhat similar products line up and packaging. "The Velvet Matt Eyeshadows with a new premium texture contain ultra-soft shimmer pigments for a velvety matt finish. Thanks to the silky, highly pigmented formula, the Velvet Matt Eyeshadows practically melt with your skin to create a radiant look." The packaging is clear plastic round compact which seems to be sturdy and travel safe. Although the design and everything are pretty, I'd prefer to depot it into my Z-Palette because single eyeshadow like this can be easily forgotten. I read other reviews where many of them find the eyeshadows are very prone to breaking where they can crush into tiny pieces if you drop them on floor. It could be because of the packaging or the formulation, idk. As the name said, it is indeed very silky and has strong pigmentation. In fact, I dare to say this eyeshadow could possibly be one of the softest eyeshadow that you would ever touched, which is a good thing as I find that the pigments can be easily pick up by both fingers and brushes. A little dap definitely goes a long way! I remember being ;O ;O at the store upon swatching this so, ya know I'm going to tell you the pigmentation is THAT good! Speaking of the finish, Catrice clearly said the eyeshadow contained shimmer yet they decided to name it with matte *side eyes Catrice*. However to me, Al Burgundy is more of a satin finish, not shimmery nor matte. Overall, there are 6 colours available and I really hope Catrice will come out with more colours. Al Burgundy is a very beautiful burgundy shade. It doesn't really have a lot of red undertone to it but instead very strong, dark purple and when it sheered out, the colour shown is slightly brown. I swatched 040 Al Burgundy both under natural and indoor lighting. It would appear more purple-ish tone indoor. 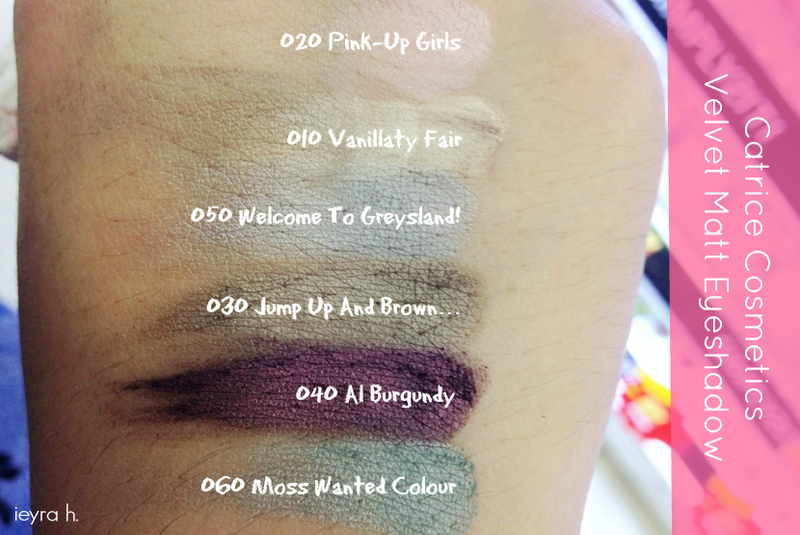 All shades are pigmented but I find that 010 and 020 can be a little chalky then the rest of the eyeshadows. Personally I think the eyeshadow is very suitable for doing smokey look, at least with this particular burgundy shade. It has no fall out when applying to my lids and it blended out easily and nicely. Burgundy makeup look was once become a trend throughout fall in South Korea because of EXO Baekhyun's infamous vampy burgundy makeup look that he wore during last year's Seoul Music Awards. There are many tutorials on Youtube for it so don't forget to check out. Longevity is great only with the primer underneath. 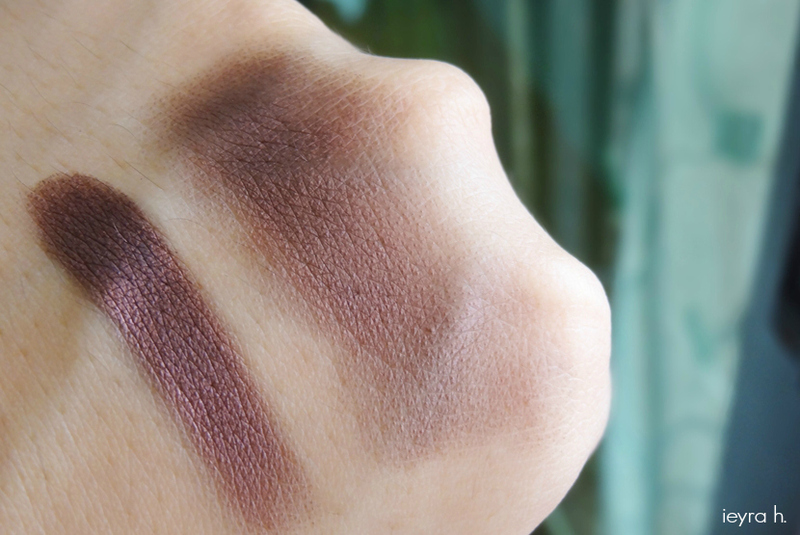 If you swatched this onto your hand without primer, it will disappear immediately when you rub it which could indicate that the shadow isn't long-lasting. Love the colour and its very pigmented! Great review! Aww.. this sounds interesting.. but of course, we saw the proof from the photos you've taken from the eyeshadow, Thanks for the swatches.. I agree this is a must try. Hope to spot one soon and so I can experience using it myself. Pink-Up Girls can appears a little chunky and powdery, but it's still such a lovely colour! I went cray-cray when I swatched it at my local drugstore. Haha. Catrice just reached my country, I'm sure it will come to you eventually since we are nearby! Hehe. I really like this al burgundy shade, it's so pretty! I love eyeshadows! The 060 Moss Wanted Colour looks really good but I like all! Great post! !